California is the third largest state when it comes to “soakable” natural hot springs. In addition, there are more mineral water hot springs in Southern California than the northern portion of the state. The Southern California border is located east of the states of Nevada and Arizona, to the south by the international border of the United States and Mexico and to the west by the Pacific Ocean. There is no official definition for the northern boundary of Southern California, but most include all the land south of the Sierra Nevada Mountains and the Tehachapi Mountains. To simplify navigation, we have set Southern California beginning at San Fransisco drawing a straight line across the state to Nevada. This portion of California has the highest population density areas of the state which include San Jose, San Fransisco, Los Angelos and San Diego clocking in at approximately 7 million people, not to mention the “smaller” cities around them. Southern California is home to Yosemite, Death Valley and Joshua Tree National Parks. You will also find Sierra, Sequoia, Los Padres and San Bernadino National forests along with a smattering of wilderness and preserves. Commercial hot springs have a private owner and are typically developed in a fashion towards more comfort, range from rustic pools to five-star resorts and usually have overnight accommodations of some fashion. Most also offer amenities like massage, yoga, swimming pools and a place to eat. Non-commercial hot springs are generally located on public national forest or BLM land. These soaks lean toward the more natural side. Hot pools can be found either roadside or off the beaten path and may involve varying degrees of hiking. Not all public hot springs have onsite camping available, but you should be able to find a place to rest your head in the general vicinity. Many of these hot springs are clothing optional, especially the ones further away from civilization. 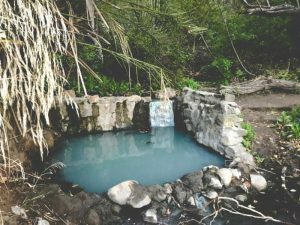 Popular Southern California hot springs include Sycamore Mineral Springs, Deep Creek Hot Springs and hot water found throughout Los Padres National Forest, the Sespe Wilderness and Death Valley. Popular regions where hot springs are located include the cities of Bishop, Desert Hot Springs, Los Angeles, Niland and San Luis Obispo. As always, please remember that if you pack it in, pack it out. It is our responsibility to keep these wonderous places around for future generations. The hot springs in Southern California listed below feature directions, descriptions, pool conditions, ratings, reviews, photos, videos and facility information and include if they are clothing optional, RV/ pet-friendly and have seasonal access restrictions. A statewide map of California hot springs is accessible from the homepage.